The White-flanked Antwren is one of the most widespread species of its kind and is one of the most common in the lowland forests of the Orinoco. Its range extends from southern Honduras to Bolivia and eastern Brazil and, of course, Trinidad. The males and females of this tiny 4-inched bird are dissimilar. Males are dark grey to black with white polka dots at the top of the wings. The edge of their tails appear to have been dipped in white. On the other hand, females are brown with yellowish underparts and rufous wings. The faint dots on their wings are barely noticeable. However, they have white flanks as do their male counterparts. For those who are unsure, flanks are the sides of a bird‚Äôs belly which are just below its wings. 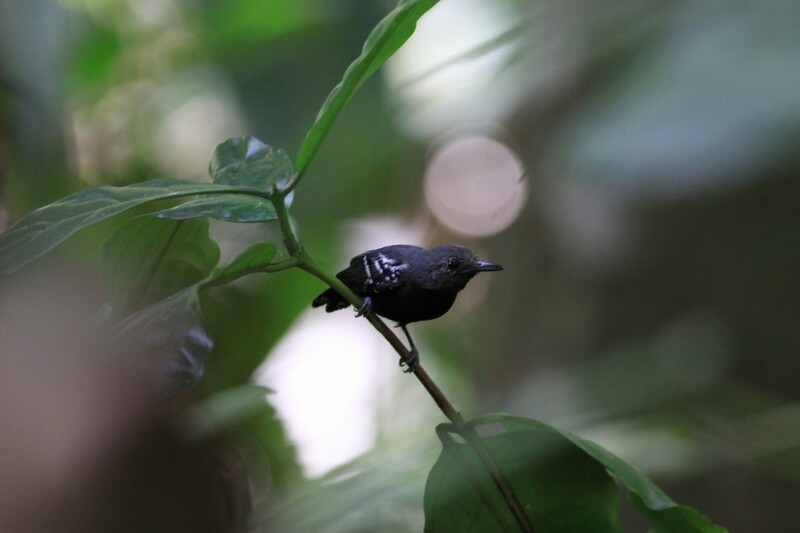 An inhabitant of our primary and secondary forests, the antwren‚Äôs flanks are seen as flickers of white. It twitches its wings while foraging for its choice of insects and other small arthropods. This antwren can also be heard chuckling rapidly, Chew- chew-cheew or whistling a high-pitched queep. It often follows flocks of other species, including antbirds and other antwrens. Our tiny avian friend breeds from April to August and makes cup nests from leaves. Listen carefully for its song the next time you are at Asa Wright.